So, sometime in October, I was trying to figure out what characters Di and Ben should go as for Halloween. I never drew the pictures of them like that, but I did unintentionally gain and develop the idea of those two as superheroes. Albeit, from a totally different source. I had to give the two of them punny names. ...oh, uh, I mean, THESE TWO ARE DEFINITELY NOT DI AND BEN. MANY DOBERMANS AND TABBY CATS CO-HABITUATE! I DOUBT DI AND BEN ARE EVEN SMART ENOUGH TO BE DOBERWOMAN AND TOMCAT! 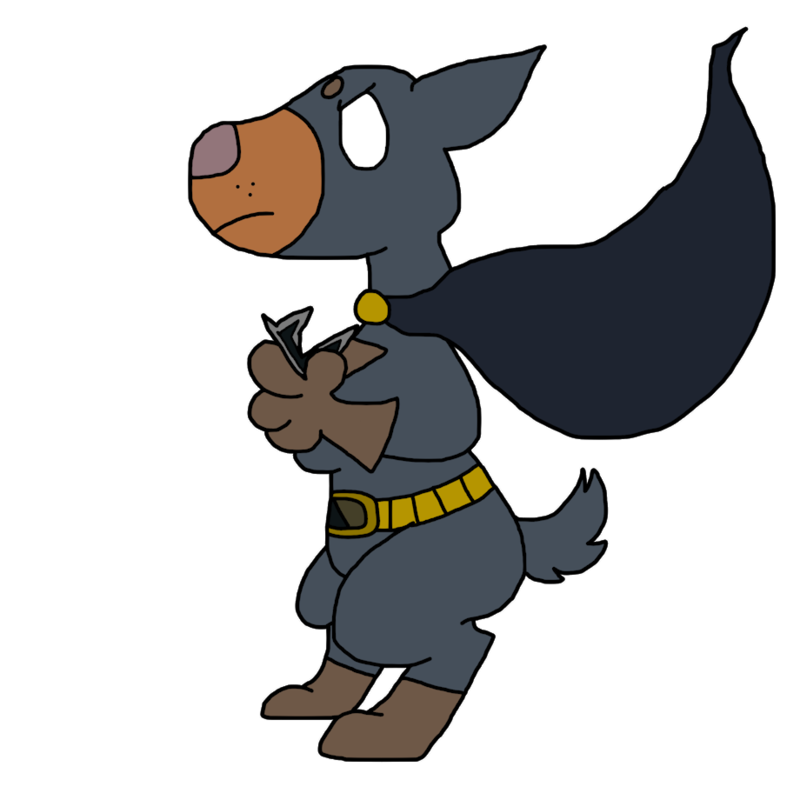 DoberWoman is one-half of DW and TC. She is more of a weapons per-- err, dog, than a melee fighter like TomCat is. She tends to be very headstrong and dominant and it often gets her into trouble at times, but when the situation is right, she knows how to be capable "leader" (of sorts). She's the one who suggested the both of them should be heroes, despite the fact she's the more pessimistic one and it seems a WHOLE lot more out of her personality to do something like this. She's extremely loyal and (mostly) compassionate and will do her best to make sure that no one gets hurt or killed, even if she sacrifices herself in the progress. She truly cares for her partner TomCat, looks up to him for his optimism, and tends to have to repay it by reassuring him that she sees him as an EQUAL and not a sidekick (that plotline hurts me a bit... :cries:). Her weapons of choice are her *regretful, but embarrassed sigh* Doberangs (miniature boomerangs shaped like... Dobermans. Because... she's a Dobie... hehe... don't look at me). Her other weapon is HER TEETH. Since this is a teaser/spoiler alerting you to their presence, I won't add anything else until I finish their Wikia pages and ref sheets.